Jocelyn A. Gravel is a Lake County native who has grown up around the practice of Family Law. Jocelyn attended Carmel Catholic High School and then moved on to earn her Bachelor's Degree from Northwestern University, where she majored in Philosophy. Upon graduation, Jocelyn attended Loyola University Chicago School of Law in pursuit of her Juris Doctor degree. 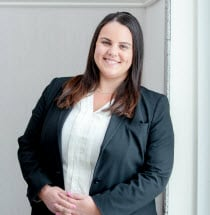 During her time at Loyola, Jocelyn made the Dean's List during seven out of eight semesters, competed on her school's Mock Trial team at competitions in Texas and California, clerked for the Appellate Court, and taught law to High School students in Chicago. After graduation, Jocelyn worked in downtown Chicago before joining the firm in 2018. Jocelyn has always had a passion for helping others and being there for them during times of need. Jocelyn is licensed to practice in Illinois, and solely practices family law. She is a member of the Illinois State Bar Association and the Lake County Bar Association, Jocelyn thoroughly enjoys advocating for her client and uses her caring but firm demeanor to obtain optimal results for her clients.